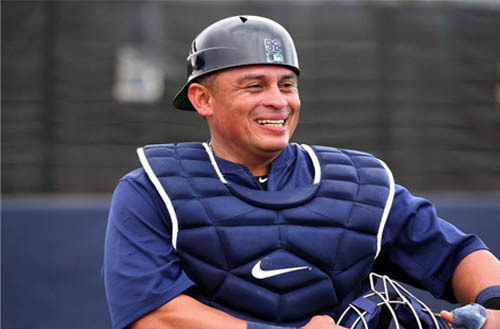 Carlos Ruiz makes his return to Philadelphia and Citizens Bank Park tonight as the Phillies host the Seattle Mariners in a quick two-game set. Ruiz, a fan-favorite, spent 11 seasons with the Phillies and played a pivotal role in their dominance from 2007 until 2011. The image of him leaping into the arms of closer Brad Lidge after a strikeout to end the 2008 World Series is one of the city's iconic sports moments. "Philadelphia holds a special place to me," Ruiz said prior to Tuesday's contest. "I accomplished a lot here and I'll never forget my time in this city." Signed by the Phillies as an amateur free agent out of Panama in 1998, the 38-year-old made his debut in pinstripes in 2006. Over his career in Philadelphia he played in 1,069 games - fifth most for a catcher in franchise history - and was named an All-Star in 2012. He ranks second all-time in franchise WAR for a catcher (22.3) behind only Darren Daulton (24.4). "Together, we had a great group of guys," Ruiz said of his teammates in Philadelphia. "Without them, I'm not too sure we would have accomplished so much." The 38-year-old was traded by the Phillies last August to the Los Angeles Dodgers. The Dodgers then sent him to Seattle in an off-season trade. He's now in the final year of a four-year deal worth $30 million. "We'll see," Ruiz said when asked what's next. "Still have plenty of season to go." In limited playing time he's hitting just .115 (3-for-26) for the Mariners.